Shrove Tuesday………. mmm………. takes me right back to the grotty old kitchen of the house we lived in when I was a kid – dingy, cold stone floor, peeling paint, an ancient gas stove, a clothes urn in the corner – a WHAT? – well, basically, a tub you plugged in which would boil your clothes for you! – obviously long before washing machines were common. You had to extract the steaming clothes with some huge wooden tongs – a risky business! We did acquire a twin tub washing machine later – the forerunner of today’s automatics. No mangle, though – that positively dangerous device with two big rubber rollers and an industrial handle – you fed the clothes through between the rollers to rid them of excess water before hanging them on the line; tumble dryers were still a twinkle in some future inventor’s eye. My grandmother had a mangle though, and I remember one of my brothers egging the other one on to put his fingers in between the rollers – which he did, of course! silly boy! Anyway, back to that grotty old kitchen – mum could work miracles in there on baking day – she would produce Welsh cakes, apple pies, bread and butter pudding (not the upmarket croissant and white chocolate version of today – this was proper bread pudding made to use up old bread – its original raisin d’être – (raisin d’être! oh, stop it!) She could bake anything …..fruit cake, sponge cake, all manner of buns and biscuits – but one of my favourites was…..the humble pancake, which she only ever made on one day of the year – Shrove Tuesday – and with no fancy additions – just straightforward pancakes with sugar and lemon juice – huge platefuls of them, which our family of 5 didn’t take long to demolish. After the age of 8 or 9 my little brother and I spent many a hilarious Shrove Tuesday trying to make and toss our own pancakes, which invariably ended up on the ceiling, or the floor, or sliding down the side of the tablecloth. Mum took two basic precautions before we started – (1) putting one of those plastic- coated cloths on the table and (2) not leaving the room, in case we started a fire, but other than that she just stood over by the sink and cringed – until she could bear it no longer and would wail ‘Oh, Doug……..!’ and dad would appear and restore order. Of course, we tend to forget the original purpose of Shrove Tuesday – a way of using up all the rich food like fat and sugar in the pantry before Lent, a period of abstinence, which in the Christian faith serves to remind us of the 40 days that Jesus spent in the wilderness, renouncing temptation. Even if you aren’t particularly religious I don’t think it’s a bad thing now and again to make a few sacrifices and exercise a bit of self discipline – albeit on a more prosaic level – something along the lines of giving up wine or chocolate éclairs. It’s a good time, too, for a bit of reflection, evaluation, or maybe even a whole new beginning; I’ve noticed how being ever so slightly hungry sharpens the mind – gives you all sorts of ideas! 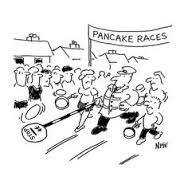 Of course, if you want to exercise the body as well, and you think you can wield a frying pan, toss a pancake and run at the same time, enter a Pancake Race – there’s bound to be a Charity Pancake Day Race near you – or get into training and do it next year if you’ve missed the boat – easily done this year because Easter is early. Why does it move about you might ask – well, you can blame the moon – Easter falls on the first Sunday after the first full moon after March 21st, so in theory it could fall anywhere between March 22nd and April 25th. I’ll leave the explanations to the experts – different religions work from different calendars, lunar and solar, and then there’s which side of the International Date Line you’re on ……. mmmm……. I’m just thinking – I remember one New Year’s Eve hearing about someone who set himself the challenge of celebrating New Year in Sydney and then rushing across to ….was it Hawaii? to celebrate it again and then haring off somewhere else to celebrate it AGAIN! – maybe I could do the same on Shrove Tuesday! More pancakes in more places! Anyway, one thing that doesn’t change is that Shrove Tuesday is 47 days before Easter, which is, of course, the original moveable feast, unless you’re Ernest Hemingway, in which case it’s Paris. Previous PostA Walk with Mu'DoggyNext PostHark, when the night is falling, Hear, hear, the pipes are calling……..